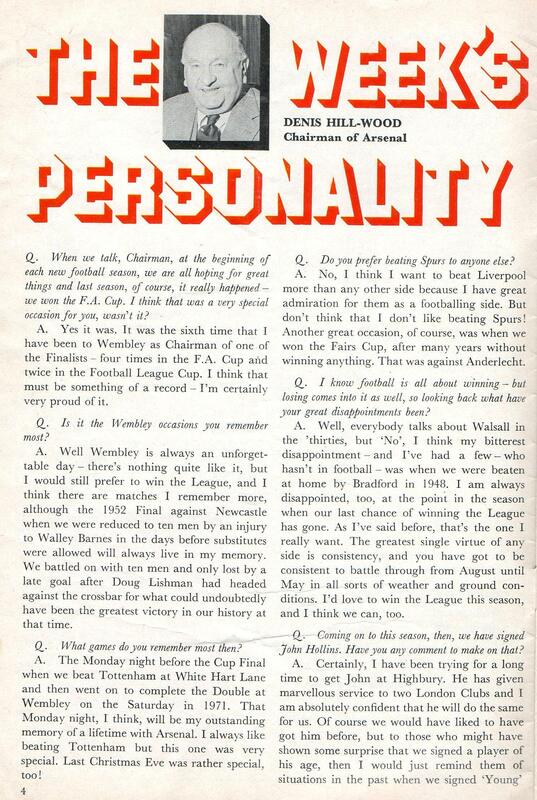 Here’s an interview with Denis Hill-Wood from the Arsenal programme at the start of the 1979-80 season. There were some similarities with the situation Arsenal are currently in, having just won the FA Cup, their first trophy for eight years. If DH-W’s words teach us anything it’s that the more football changes, the more it stays the same. Reading his comments it seems that really the only difference is the amount of money involved. The Chairman laments the cost of keeping the stadium up to scratch – up to three quarters of a million pounds over the previous few seasons. 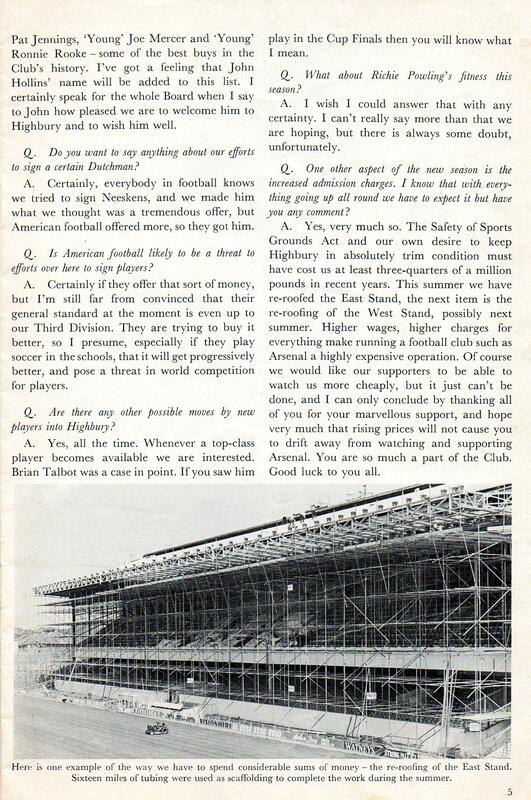 There’s a great picture of Highbury’s East Stand smothered in scaffolding for re-roofing during the close season, though sadly the exact amount spent on that exercise is not revealed. DH-W ends by saying how much the fans mean: “You are so much a part of the club.” Yes, it’s obvious PR, but personally I feel that old Denis did have more genuine concern for the average fan than the more recent Board members. Maybe I’m just naive though. Maybe football club owners have always been solely concerned with themselves. The Hill-woods did often take on the view of the Smaller clubs. Lets not forget that Dennis fathers first club was Glossop, the smallest town in the top division. In other words, football is a family of other clubs and fans. The Hill Wood family were often looking out for not just Arsenal but football in general. Unfortunately, those days are sadly gone. You’re right. There is plenty of evidence of the Arsenal Board up to Denis H-W’s time being keenly aware of the bigger picture. I’m surprised Gordon didn’t ask him how his golf was. If you look through these interviews you will see he a common theme of asking the interviewee about golf. Phil, while I haven’t touched base with you for a while I have been reading your posts. If I may be blunt and to the point, what Peter Hill-Wood had to say thirty.odd years ago is of no consequence now. Arsenal drew one all with Leicester today in a match that they had dominated . The moron in charge left an idiot , clueless, circus oddity on the pitch masquerading as a footballer. The same arrogant mismanager had Podolski and Campbell sitting on the bench twiddling their thumbs. Wenger is finished. He is of the old school whose tactics are predictable and parsimonious ways are legend. I want him out sooner rather than later and I would like with your permission to begin the debate here. Noel, if you want to write something a bit longer for me to post and let people debate I’m happy to do it. Wistfulness aside, this old boy was so concerned about the fans that at no point under his “stewardship” did he put fan into a tangible ownership and control position in the club. However, he was also so concerned as to SELL said shares to Dein & Fisman. Said shares now held by Usmanov and Kroenke. Cry me a river over this man’s “concerns”. Denis died in 1982; Dein joined the Board in ’83 and Fiszman in ’92. I think you’re confusing Denis with his son Peter. Denis was superior in my opinion.